CNN is reporting: “As President Trump struggles to move on his policy agenda, top administration officials are headed to Capitol Hill Wednesday to talk about tax [legislation] with a group of moderate House Republicans. He said today: “Americans may hate taxes generally, but they also favor higher taxes on corporations and the wealthy. This has been true for the past four decades, even at historical moments commonly associated with anti-tax sentiment. Two-thirds to three-quarters of Americans favored higher taxes on the rich when Ronald Reagan cut them in the early 1980s. Two thirds favored higher taxes on the rich when George W. Bush lowered them again in 1981. And it remains true today. 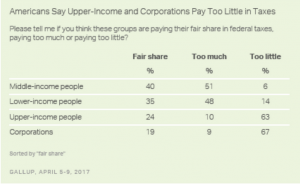 As President Trump poses as the voice of ordinary people and proposes massive tax cuts for corporations and the wealthy, 63 percent want higher taxes on the rich and 67 percent want higher taxes on corporations. Only 9 percent and 10 percent support tax cuts for business and the wealthy.